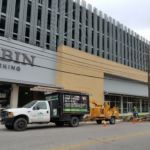 Downtown Tree removal work, Tobin Parking area. Canopy Tree at Tobin Center. Canopy Tree Service recently performed a downtown tree removal at the Tobin Center. The center showcases San Antonio’s quality performing arts which attracts both visitors and new residents. The place now known as the Tobin Center for the Performing Arts began as a simple auditorium in 1926. A few years back, local visionaries organized a $203 million renovation of the site. Located on 4th Street in San Antonio, the Tobin Parking Garage serves the Tobin Center for the Performing Arts. This garage has landscaping around it. In November 2017, a need arose for a downtown tree removal. Fortunately, it was not a heritage tree. The tree was a hazard to anyone traveling on foot to see our leading symphony, opera and ballet companies perform there. Naturally, nobody wanted to be responsible for tree limbs bopping a person on the head. Canopy Tree Service was called upon to handle the tree removal in the heart of downtown San Antonio. The removal took place early on a Saturday morning to minimize traffic inconvenience in downtown San Antonio. Tree limbs fall on a roof and suddenly create a point of water entry. Tree limbs rub roof shingles and cause slow leak. Owners often don’t notice the problem until their ceiling stains inside. Tree roots cause foundation cracks and settling which eventually leads to water penetration. But trees themselves can actually suffer water damage. In urban environments, tree wounds are usually unintentional and caused by automobiles, improper pruning, lawn mowers or construction equipment, or lightening. “Tree wounds can penetrate the bark and damage the underlying cambium layer,” says Shane Kelly, founder Canopy Tree Service. Once this happens, decay-causing fungi can enter the tree. Some trees recover and others don’t. Taking a wait and see approach to tree recovery works well in rural areas, but weakened trees near sidewalks and parking spots pose special risks to people. Sometimes it is necessary to remove a tree that looks reasonably healthy on the outside, but has structural weakness. 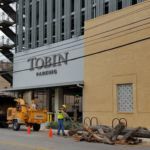 In this case, the tree next to the Tobin Center had a strong potential of falling limbs so tree removal was ordered. Bats are very common near the Tobin Center. So it was not surprising when workers discovered a tiny bat all by itself in the tree. Leaving it on the sidewalk would not be right. So workers carefully approached it with gloved hands and placed it gently on a towel. Fortunately, relocation to a distant spot was not really necessary. The nearby San Antonio River walk has a 50,000 member colony of Mexican free-tailed bats. Bats feed on agricultural pests and their preservation is regarded in San Antonio as a good thing. “Saving the bats is a good thing. Besides, it feels right,” said Kelly. In addition to bat conservation, the tree trunk that was cut down was recycled, rather than added to a landfill. Whenever possible Canopy Tree Service recycles the trees. If you have a tree that needs to be removed, or perhaps you are wondering if it can be saved, the first step is a no-obligation consultation with a certified arborist. 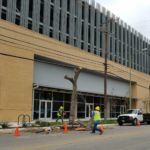 In addition to downtown tree removals, Canopy Tree Services works on both residential and commercial sites in the Greater San Antonio area. To set up an appointment, please complete this brief estimate request. To read more about tree removal on the Canopy Tree Service web site, visit our Tree Removal page. 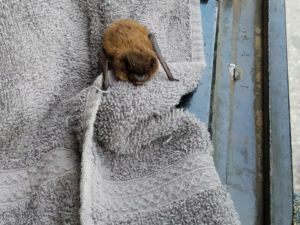 Bat rescued from tree being taken down.